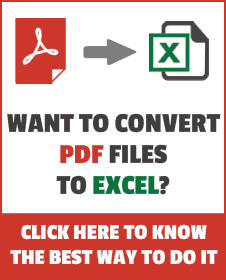 Copying and Pasting data is one of the most performed actions in Excel. There is a lot more to copy pasting then simple Control + C and Control + V.
In this tutorial, you will learn all about the Excel Paste Special feature and useful Excel Paste Special Shortcuts. 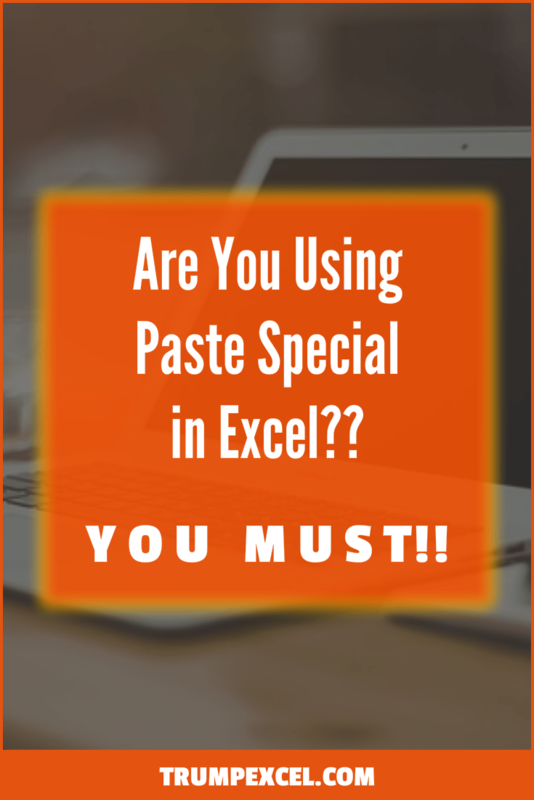 What is Excel Paste Special? What happens when you copy a cell in excel and paste it somewhere else? It copies not only the content of the cell but also the format such as background color, font color, borders(as shown below). But what if you want to copy only the cell contents and not the formatting, or only the formatting and not the values, or only the formula within it? You can’t do that with a simple copy paste but you can do that using Excel Paste Special functionality in Excel. Accessing Excel Paste Special Options? 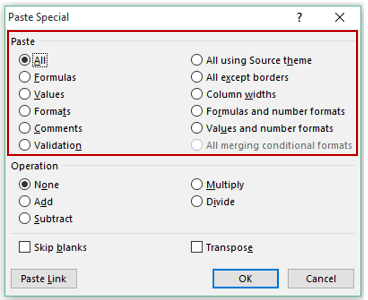 There are a couple of ways you can access the Excel Paste Special features. Using the Ribbon: Go to Home –> Clipboard –> Paste –> Paste Special. This will open the Excel Paste Special Dialogue box. Using Keyboard Shortcut: Use the Excel Paste Special Shortcut – Alt + E + S + V.
Using Right-click Menu: Right Click in the cell where you want to paste, and then select paste special. It could be overwhelming to see so many options for something as simple as copying and pasting in Excel. However, when you go through these, it makes a lot of sense to have these options available. 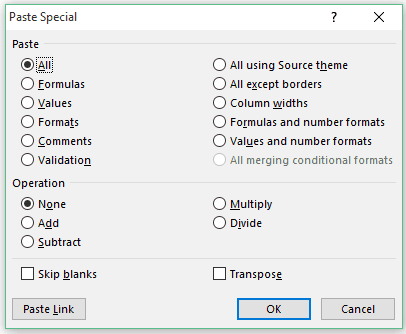 If you have a good grip on these Excel Paste Special options, it can save you a lot of time (and you know time is money!). These options enable you to paste selectively. For example, you can choose to only paste formulas, or values, or formats, or comments, etc. To use these, simply copy the cells, go the cell where you want to paste it, open the paste special dialogue box, and select the desired option. For example, suppose you have a data set where you have formatted the data using borders and fill colors. 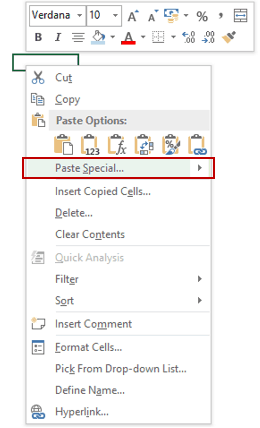 If you want to copy only the values, copy the data, go to the destination cell where you want the data to be copied, open the Excel Paste Special dialog box and select Values. This will only copy the data and not the formatting. Operations options give you a quick way to perform the given operations without applying a formula or directly changing the cell contents. For example, let’s say you have some numbers that are in millions, and you want to convert it into billions. One way of doing this would be to create a formula where you divide the number with 1000. In an empty cell, enter 1000. Select this cell and copy it (Control + C). Select the cells that you want to convert from million to billion. Open the Paste Special Dialogue box and select Divide option. That’s it! It will convert the numbers into billions. In a similar way, you can use other operations as well – Add, Subtract,or Multiply using Paste Special. 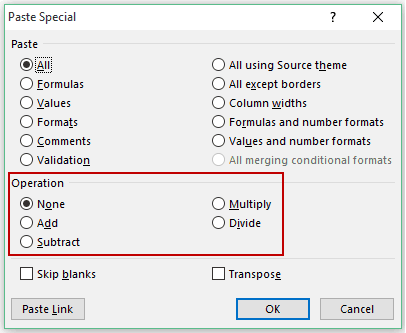 Apart from Paste and Operation option, there are two additional options in the Excel Paste Special dialogue box. Transpose: As the name suggests, if this is checked, it transposes the data when you paste it. 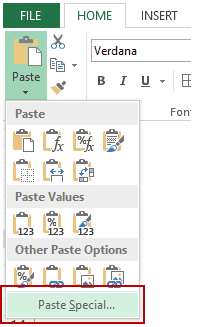 If you start using Excel Paste Special when you copy and paste data in Excel, knowing a couple of keyboard shortcuts will save you a lot of time. To Paste Values only – Alt+E+S+V + Enter. To Paste Formatting only – Alt+E+S+T + Enter. To Paste Comments only – Alt+E+S+C + Enter. To set column width same as that of the copied cells – Alt+E+S+W + Enter. To copy but in a transposed manner – Alt+E+S+*+E+ Enter (striking that extra ‘E’ at the end checks the transpose option. The * indicates that you can use it with any of the above-mentioned shortcuts. So for example, to copy values in transposed manner you would use Alt ESVE + Enter). Hope these Excel Paste Special shortcuts are helpful. While you may not remember these all, it’s a good practice to consciously use these for a couple of times and then you will know these like the back of your hand. Five Powerful Excel Formatting Shortcuts. I use Ctrl+Alt+V to display the paste special pop up. I use 2007 & 2010 . Yes very comfort to use this keys to while working and save time. Hey Chris.. You’ll have to paste twice. So copy just once and while pasting, use Comments the first time and format the second time. If you want to copy comments and formats whithout anything else what should i do? Copy the cell and when pasting, you can only paste the comments and formatting. To do this, copy the cell, go to the destination cell and use the keyboard shortcut ALT + E + S. It will open the Paste Special dialog box. There you can first select Comments and then select Formats. This may work but it still a lot more than what I had to do in the past. For copying values only I just would use CTRL-SHIFT-V, so much faster that all those button presses and enter; or pop-up clicks.